Quentin Tarantino's ninth movie, Once Upon a Time in Hollywood, will mix his usual ensemble-heavy pop-culture-infused storytelling with a real-life tragedy. Focused mainly on fictional characters, the feature's backdrop will be Tinseltown in the late 1960s, with a specific link to a true crime involving famous Hollywood players. Sony has unveiled the first trailer for the movie, which looks like a period romp celebrating the movie and TV industry of 50 years ago with focus on the importance of stunt performers. And not as much attention on the Manson Family murders, which we all thought the project was primarily about a few years ago. Watch the spot below after reading all about the movie. Sign up for a Fan Alert for Once Upon A Time In Hollywood to find out the moment tickets go on sale. What is the plot of Once Upon a Time in Hollywood? Vanity Fair got the original scoop on the basic plot synopsis, which involves a male TV star, hot off a hit series, and his stunt double sidekick as they both try to transition to the movies. Set in the summer of 1969, the story unfolds at the same time as the Charles Manson-ordered murders of then-pregnant actress Sharon Tate and four others, which forms a backdrop for the central narrative. The first to be linked to the movie was Margot Robbie, who was ultimately cast, quite perfectly, as Sharon Tate, wife of filmmaker Roman Polanski and star of such films as Valley of the Dolls and Polanski's The Fearless Vampire Killers. After rumors that Tom Cruise was also up for a role, Leonardo DiCaprio and Brad Pitt signed on to play the fictional actor and his fictional stunt double, respectively. Al Pacino and Bruce Dern (replacing the late Burt Reynolds, who was cast but passed away before shooting began) will represent the elder generation, the former while playing a Hollywood agent representing DiCaprio's character and the latter as ranch owner and Manson Family landlord George Spahn. In addition to those big stars, Dakota Fanning is playing Manson Family member Squeaky Fromme (who later attempted to assassinate President Gerald Ford), Damian Lewis will portray iconic actor Steve McQueen, Luke Perry is playing actor Wayne Maunder, Mike Moh is portraying Bruce Lee and Emile Hirsch has been cast as hairstylist Jay Sebring, who was also killed in the murders. Rounding out the ensemble in supporting roles are Tarantino regulars Tim Roth, Zoe Bell, Michael Madsen and Kurt Russell along with James Marsden, Timothy Olyphant, Martin Kove, Clifton Collins Jr., Scoot McNairy, Spencer Garrett and Nicholas Hammond. Can we see what any of the cast looks like in their roles? Robbie got to share her own first look on Instagram more than a month later and, as expected, she looks spot on as slain actress Sharon Tate in a black and white outfit with go-go boots. Check out an image of the real Tate in a similar outfit here. Which studio is putting out the movie? Tarantino recently severed ties with The Weinstein Co. following the news about Harvey Weinstein's sexual assault and harassment of many women over the past few decades. Tarantino had worked with Weinstein for most of his career, so the industry wondered where he would go with his new movie. Filling the void, Sony won a bidding war for the distribution rights. 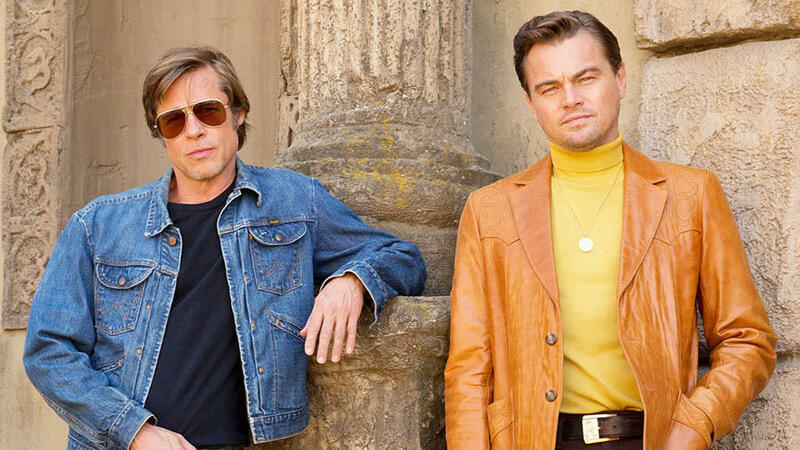 Sony has scheduled Once Upon a Time in Hollywood for theatrical release on July 26, 2019.